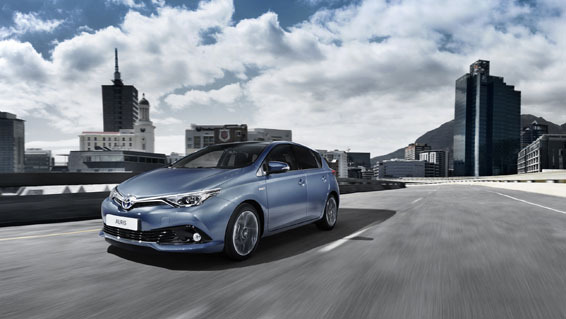 The Toyota 1.2T, an all-new, direct injection turbocharged petrol engine, makes its global debut in the new Toyota Auris. It belongs to the range of 14 new engines that Toyota is launching globally between April 2014 and the end of 2015. Last year Toyota announced its plan to introduce a series of new, highly fuel-efficient engines, created using a number of combustion and loss-reduction technologies that had previously been reserved for hybrid engines. The new four-cylinder 1.2T engine is the second unit from this family to come to Europe bearing the Toyota badge, following on from the three-cylinder 1.0-litre engine that was introduced in new Aygo and Yaris in 2014. Like the 1.0-litre, the 1.2T uses advanced technologies that allow it to change from the Otto to the Atkinson cycle when running under low loads, vertical vortex high tumble air flow intake ports, an exhaust manifold integrated in the cylinder head and advanced heat management measures. The 1.2T adds to this a direct injection system and a water-cooled turbo and heat exchanger. Furthermore, the VVT-i intelligent variable valve timing system featured on the 1.0-litre is upgraded to a VVT-iW (Variable Valve Timing – intelligent Wide) system, which allows even more valve timing flexibility. The combination of these technologies results in outstanding performance and efficiency. With a displacement of just 1,197cc, the engine delivers 114bhp (85kW) and constant torque of 185Nm between 1,500 and 4,000rpm. It will push the new Auris hatchback from rest to 62mph in 10.1 seconds. Acceleration from 50 to 75mph in fifth gear takes 13.7 seconds, and top speed is set at 124mph. All of this is achieved despite a focus on fuel economy and CO2 emissions: the car achieves 60.1mpg* on the combined cycle and 109g/km* of CO2. The key to achieving this level of fuel consumption without compromising performance is to apply higher compression, but generally, as compression increases, so does the risk of uncontrolled combustion – “knocking”. The 1.2T’s high 10:1 compression ratio has been made possible thanks to a series of technologies that improve control of the combustion process. This way, the risk of knocking can be avoided. First, the intake ports have been designed to generate a more intense flow and a “vertical vortex” and the piston shape has been optimised to improve in-cylinder turbulence. As a result, fuel and intake air mix faster and form a more homogenous mixture. This leads to a higher combustion speed, which helps prevent knocking. Advanced heat management in itself is a great way to improve fuel economy, but it is also another way to reduce the risk of knocking. The 1.2T engine was designed in such a way that the temperature of each individual part can be optimised. For example, the bottom of the pistons is cooled by oil jets and the cooling of the cylinder head is separate from that of the engine block. This means the temperature in the combustion chamber can be reduced, while keeping the block itself hot enough to reduce friction. Direct injection makes a contribution as well, as it helps dissipate the heat in the combustion chamber, and the charge air passes through the intercooler, which uses a low-temperature cooling circuit. A low-inertia turbocharger, the VVT-iW valve system and the D-4T direct injection system work together to ensure excellent torque delivery, from the lowest engine speeds. Together with the limited-volume intake system, this ensures immediate response when the accelerator pedal is pressed. The injection system has been newly developed for the 1.2T engine. Compact in design, it is perfect for use in a small displacement engine. It allows multiple injections per cycle and the optimised width and reduced length of the spray pattern ensure combustion quality, regardless of engine regime and load. The VVT-i system operates on both the intake and the exhaust side, and allows torque to be maximised at all engine speeds. In addition, the VVT-iW allows for intake valve closing to be delayed, which means the engine can operate in both the Otto and Atkinson cycle. The Atkinson cycle is used in extremely low engine load conditions, when the intake valve remains open for a fraction of time, after the compression stroke has set in, allowing part of the gas charge to be pushed back into the intake. As a result, the effective compression stroke is shortened. Pumping losses are reduced, as there is less pressure on the piston, and the throttle valve can be opened wider. A new start control has been developed to ensure quick and smooth engine restart. When the system shuts down the engine, it controls the stop position to leave the piston half way in the compression stroke. On restart, it applies stratified injection in the first compressed cylinder to counter vibrations. And by retarding the ignition, torque increase is kept in check, preventing the engine from revving excessively, thus ensuring a calm and confident take-off. Good morning, could I mount an LPG system on this 1.2 T engine? Would it make some damages to the valves? Is there any precautions to be taken? Is it advisable to wait 30s before turning the egine off after driving at high rpms just like any other turbo charged car? Or there’s no need to wait 30 secs with the CHR? Also, is it ok to install an after market dump valve on it? The C-HR 1.2 features a turbocharged engine. Therefore, it is advisable to let the engine idle for approximately 1 minute after the vehicle has been driven at high load conditions for a long period of time. This will allow the turbocharger to cool down and will ensure the longevity of this component. In regards to the damp valve, we would not recommend the use of any after-market components. Thanks. Do you not recommend the use of after-market dump valves for the CHR only, or do you not recommend it for all turbo charged engines? We would not recommend the use of any after-market dump valve on any Toyota turbocharged engine. We are also unable to confirm on whether or not there would be any possible side effects to the engine as a result of using these dump valves. Hi I have just received my new 1.2 turbo auris only done 500 miles . Should I be getting more than 35 mpg combined? Thanks for getting in touch. The mpg rate will depend on how you drive; the faster and longer the journey, then the lower it will be. Also as you have only done 500 miles your car is building up the average mpg, so as long as you continue driving well the mpg will be better. Hope this helps. I’m getting ~20 mpg with this car in the city. Toyota dealer claims this is normal. Fuel consumption in the city is exactly the same as it is with 2.0 Avensis (I test drove it in exactly same conditions). Would have never bought it if I knew that. This is great, we believe Toyota will continue making better and better innovations to meet the competitive auto world….. The Toyota 1.2T, an all-new, direct injection turbocharged petrol engine, makes its global debut in the new Toyota Auris. Any news on offering the Aygo with a more powerful engine? Could a Toyota 1.2 unit fit, old 1.3 engine recently dropped from the Yaris or could even the PSA 1.2 unit be fitted instead? The Aygo is a very good small car that’s just crying out for a slightly more powerful engine option. We have no information on the future of our models, any developments will be announced on the blog or our social channels. Many thanks. Thanks for getting in touch. The new Auris Hybrid has a chain. The Hybrid engine is manufactured in Deeside and the transmission is built in Japan. Hope this helps. We’re glad you’ve got all the information you need! We’re sorry for the delayed response. Our technical team have requested your VIN or registration number so they can investigate your query further. Many thanks. Prices vary around the country. We would have to suggest contacting your local dealer with this question. Many thanks! This engine is chain driven. Many thanks! Is the 1.2T engine an option in the new CHR? Is the power output or CO2 figure being improved anytime soon. How does the NOx output compare to similar engines? Both OK but not class leading for this type of engine compared to VW 1.4TSI etc.? Thank you for your post and interest in Toyota C-HR. We would advise keeping an eye on our blog for all the latest news and features released about Toyota C-HR later this year. Many thanks. Is this 1.2T still durable just like the old 1.6? Hi Khanh, thanks for the question. The 1.2T is an all-new engine that has gone through Toyota’s stringent testing procedures. Toyota has a strong reputation for reliability and the new engine follows in the footsteps of this reputation. Finally got the auris 1.2, But one question is: how to Permanently turning off stop/start ? Thank you for your post. We have spoken with our technical team and stop/start cannot be turned off permanently. However this can temporarily be turned off each journey by pressing the stop/start button under the gear stick to the right. Hope this helps and if you have any more questions please let us know. can we see this engine in TURKEY market ? Hi. We suggest you direct your question to Toyota in your local market, in this case Toyota Turkey – http://www.toyota.com.tr/. Thanks. Hi Ümit. That’s a shame, but unfortunately we’re unable to help any further. Keep an eye on your local Toyota’s website for more news and information. Thanks. It would be really nice to see this engine in the Aygo. Thanks for your feedback Ascon. We will pass this onto our product team for you. Will this engine be fitted to other models e.g. Yaris and Aygo? No news regarding other models for this engine at the moment unfortunately. We will be sure to keep our Blog updated with the latest news. thanks for the description. any details about the NOx and CO emissions of this engine? More information about this engine will be released nearer the launch so do stay tuned to our Blog for the latest news.